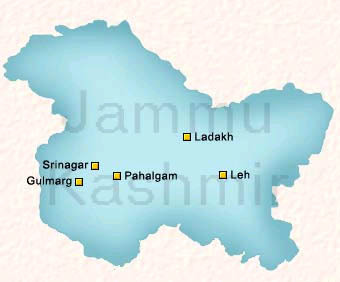 19 Sep : An all-party delegation will arrive in Srinagar on Monday on a two-day mission to assess the ground situation and try and meet various separatist groups in a bid to break the impasse in Kashmir that has been witnessing unabated violence for the last several months. On the eve the arrival of the 38-member delegation, Jammu and Kashmir’s main opposition PDP, however, threatened to distance itself from it for what they termed as “repressive” tactics of the state government. The team, which is likely to be led by Home Minister P Chidambaram in case Finance Minister Pranab Mukherjee fails to make it due to his prior engagements, will be meeting some of the trader associations and tour operators. An invitation has been extended to Hurriyat Conference factions led Syed Ali Shah Geelani and Mirwaiz Umer Farooq as well as to JKLF chief Yaseen Malik for participating in the talks with the all-party delegation, whose main aim is to bring some relief to common man who has been reeling under constant strikes and mob violence which results in curfew. Among the members of the delegation will be Arun Jaitley and Sushma Swaraj (BJP), Mulayam Singh (SP), T R Baalu (DMK), Ramvilas Paswan (LJP), Sharad Yadav (JD-U), Rajniti Prasad (RJD), Dinesh Trivedi (Trinamool), E Ahamed (Indian Union Muslim League) and Govind Rao Adik (NCP). Asaduddin Owaisi (AIMIM), Rattan Singh Ajnala (SAD), Narhari Mahato (Forward Bloc), Prasanto Majumdar (RSP), M Thambidurai (AIADMK), Basudeb Acharya (CPM), Gurudas Dasgupta (CPI) and Farooq Abdullah of the National Conference will also come but representatives of Shiv Sena and TRS are yet to confirm their arrival in Kashmir. Hectic activities were being witnessed in Sringar on Sunday with the authorities finalising the delegations that would be meeting the all-party team. Such an all-party delegation was coming to the state after a gap of 20 years. In 1990, an all-party delegation led by then Deputy Prime Minister Devi Lal had come to review the law and order situation in the state. The government’s main message in sending the all-party delegation to the embattled state was to convey to the people that “the entire country is with you” as well as to ensure that the parliamentarians are placed “face to face” with the ground situation. “The feedback received from the all-party delegation would form an important input in the government’s evolving response on various issues relating to Jammu and Kashmir,” said a statement issued after an all-party meeting convened by Prime Minister Manmohan Singh on Wednesday. Meanwhile, PDP on Sunday threatened to reconsider its participation in the all-party initiative of the Centre and accused the state government of sabotaging the visit of the delegation by clamping curfew in the valley. “If the repressive measures continue, we will have to reconsider our decision (of being part of the all-party initiative). Our MLAs are not able to reach us. Nobody would go to meet the delegation while being insulted at every nook and corner as strict curfew has been imposed,” PDP president Mehbooba Mufti told reporters in Srinagar.